Sony Pream at the Cambodian Association of America offices. Photo by Greggory Moore. But Sony Pream is talking about it. I’m sitting with her and Sydney Meth, two of a legion of Cambodians who fled the horror and havoc wrought upon their homeland by the Khmer Rouge during the last half of the 1970s. And though not yet teenagers when they immigrated to the United States, their experiences during those formative years impact them to this day. A common side-effect of the suffering and loss experienced in Cambodia three decades ago that plagues many survivors today is difficulty fully connection and revealing themselves emotionally, even with their own children. Pream, for example, recalls crying one day when she saw her mother, from whom she was separated but would sometimes see at mealtime. “‘Why do you cry? '” she recounts being asked by soldiers, as if there were something unnatural about her attachment to her mother—which, in the Khmer Rouge groupthink, there was. She had been told she belonged to Angkar (the term used to refer the Khmer Rouge’s shadowy superstructure), and not her parents. So even though Pream was only four or five, she had enough sense of the peril in which her feelings put her to dissemble, telling the soldiers she had eaten food that did not agree with her. For her part, Meth remembers sitting outside playing, when three soldiers tapped her on the shoulder and asked for her father. She remembers going upstairs to fetch him. She remembers his hugging her, kissing her on forehead, looking her in the eyes. She remembers starting to follow him down the road as the soldiers escorted him away, and his telling her to go back home. She remembers hearing the gunshot, how close by it was. And she remembers her uncle coming to the house that night and breaking the news to the family: her father was gone. And both women remember the hunger, the constant, acute hunger that left them perpetually in survival mode. Enduring for years in such a state—along with the fear, the loss, and the need to cover emotion—resulted in two generations simultaneously losing ability to connect. And while it was possible for some to leave behind the physical peril, the emotional trauma was indelibly imprinted, with many parents unable to transition into a more emotionally co-present mode. Not surprisingly, a dearth of affection from parents often means the children never learn to express affection to their own children—a problem with which both women wrestle. But both women have learned much about themselves and their parents from their work as counselors at the Cambodian Association of America (CAA). Meth and Pream are doing what they can to break the cycle of insufficient connectivity, being forthcoming with their children not only about their experiences under the Khmer Rouge, but also about their resulting emotional struggles. And so, despite her difficulties, Pream is receptive when her daughter solicits information about what transpired all those years ago in that faraway land of their shared heritage. And progress is made. Meth got an unintended glimpse of that progress first-hand when she overheard her daughter talking to a friend about her Meth’s experience, telling the friend that Meth is strong, a role model; and that she feels Meth’s strength will help her become a successful adult. It’s a hard, sometimes painful fight, but one worth waging. And it can be won, gesture by affectionate gesture, word by loving word. 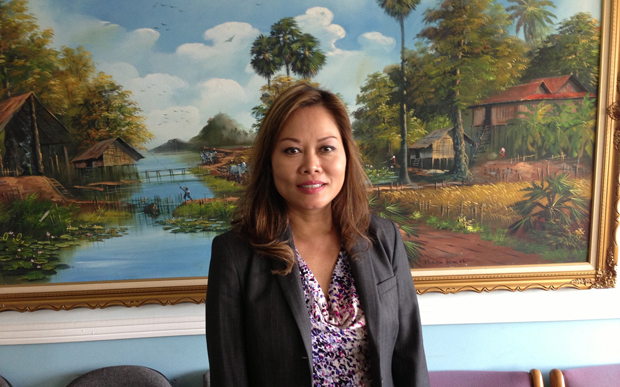 “The younger generation of Cambodians are suffering because many parents are still dealing with the trauma of the Khmer Rouge decades ago,” says CAA’s Monique San. “They crave love and attention from parents who don’t know how to give it to them because they witnessed their families murdered in front of their eyes. […] Many youth are turning to drugs and alcohol at a young age to gain acceptance and love.” With this in mind, the CAA is holding a “Rally Against Underage Drinking” 6PM Friday, April 26, at CAA HQ (2930 Pacific Ave., LB 90806). For more information, call 562.988.1863 or visit cambodianusa.com. See Part 1 to meet one of those children.